Home » First of our community centenary celebrations a great success! 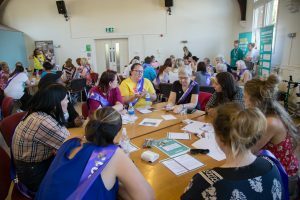 As part of the 100 years of women first getting the right to vote, the Women’s Lives Leeds project in partnership with Leeds Women 2018 are hosting a series of creative workshops and events across the city to celebrate this momentous occasion. 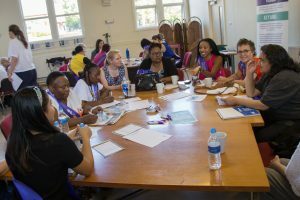 Aligned with each of the Women’s Lives Leeds Community Development Workers’ localities, events will take place in the North and West, East, South and centre of the city. Each event will combine an exhibition of creations of the women who have participated in the workshops that have focused on what voting and politics means on a local scale, issues in their communities, what matters to them and how t/*hey feel empowered, with how they can practically engage in local politics, from campaigning and petition starting, to involving their local councillors and MPs on issues. Chaz turned to poetry roughly 15 months ago when she was experiencing very poor mental health. From being able to turn her negative experiences in to written word, she found she learned to tackle the negatives in her life and dealt with them in a way that empowered and supported her. Chaz brought her expertise to the creative workshops and encouraged the women to write about things that were meaningful to them; from fun exercises about what makes the women laugh, to deeper exercises where the women were asked to write a letter to something meaningful to them, there was a focus on power- what is power? Who has power? How do you gain power? Through this the women were able to write and talk about both practical and emotional ways in which they could practice gaining power and exercising their current power. Women’s Lives Leeds and Chaz would like to thank the women from East Leeds Parent Champions, Together Women Project, the ESOL group at Little London Community Centre and the group of refugee and asylum seeking women at Meeting Point in Armley for their incredible engagement and participation at the workshops and the event. The poems were written in English, Polish and Arabic and were displayed at the West Leeds event. 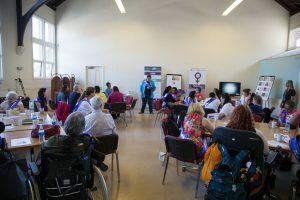 The first event took place on Wednesday 27 June at Woodhouse Community Centre in Hyde Park. The event focused on four specific issues: homelessness and housing, women’s safety (In the community and at home), how to engage refugee, asylum seeking and migrant women in to services and local politics, and finally how to become better involved in politics including discussions lead by a local councillor on how she winded up involved. After the conversations all tables were given an opportunity to put questions that had been raised on each table to the various elected members. Elected leaders, (councillors), from across the West of Leeds attended to support the event and talk about their experiences in local government and the differences they see made on a daily basis from their work. They also spoke on the importance of female representation in politics and how things over the past few years have been changing, to encourage more women in to politics which in turn helps drive gender specific issues such as the gender pay gap and maternity pay to the forefront. To round off the event, we had three women speakers; two read out the pomes they had created in the sessions and one woman spoke about her experience as a woman in politics, the law and as a women’s rights campaigner in Afghanistan and her experience as a refugee woman on moving to Greater Manchester having fled the Taliban in 2010. 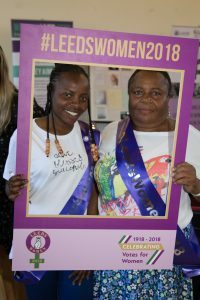 All women who participated, sharing their stories and their creations received a wealth of applause from the rest of the room; sharing their vulnerabilities, their strengths and talking about what politics means to them, were truly inspirational. The next event will be in the South of Leeds on Wed 18 July, led by Community Development Worker Sabina Hussain.